These are the surnames of our readers whose ancestors came from County Westmeath. 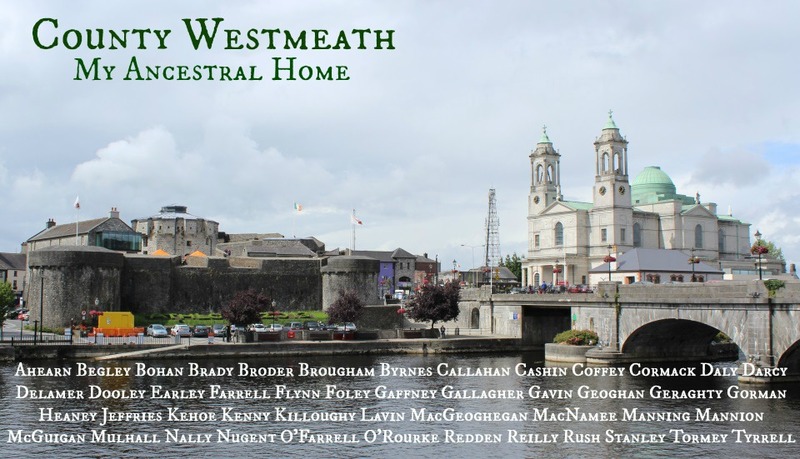 Is your County Westmeath surname here? And this is a picture of one of the oldest settlements in Ireland – bridge over the River Shannon in the town of Athlone. No added Pauline – great link to movie royalty. Conaty was also short for Connaughty in Ireland. Mike. My grandfather is a Farrell. We have traced his family back to Capt. Hubert Farrell from Westmeath Longford Ireland. Cant wait to visit Westmeath some day. That’s my 11th great grandfather. I’m a Ferrell from North Carolina. Traced my ancestors back to Hubert from Westmeath as well. My family is also related to Hubert Ferrell from Ireland. Does anyone have his parents information? I have just recently found your site and it ‘s simply wonderful. I do have a question which I hope you can shed some light on. My great -gr -gr-grandfather was supposedly from Athlone . I how ever can find no direct immigration for him and the Canadian census I have has his birthplace listed as Gibralter or Spain ? Would this have been a ships port stop on travel ? I wondered if he could have been born on board the ship ? The family which I think was his immigrated to Canada in 1832. The family name is Duggan . Any guess or explanation might be of help. Thank you . Jackie Duggan Richert. Looking for Farrell family of Westmeath. My dad was adopted from Dublin in 1964. Birth mother was Nancy “Ann” Farrell originally from Westmeath. She had ten brothers and sisters and was born around 1932. My great-great-grandfather, Michael powers, came from Westmeath. He was born in 1830 in Killucan and immigrated to America with two of his brother in 1855. His father was John Powers and his mother was Margaret Cole. He ended up settling in Carroll County, Georgia.